MADISON, Mississippi, April 3, 2019 /PRNewswire/ — Vertex Aerospace has expanded its global presence by establishing a regional office in Abu Dhabi, United Arab Emirates. The Company received its license to practice business in the UAE March 5, 2019, under its Vertex Global Aerospace business line. Vertex Global Aerospace, or VGA, was formed January 1, 2019, to globally offer Vertex’s complete solution for aftermarket aerospace services for government and commercial clients. 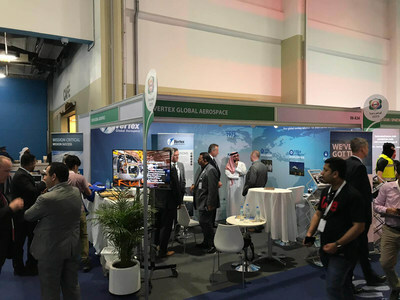 The leadership of the newly established VGA business line held a soft opening February 16, 2019, at its Abu Dhabi location and attended the city’s International Defence Exhibition and Conference in the same week. Steve Suttles, senior director of VGA’s Middle East and Africa business operations, said the Company is pleased to open its first regional office in the UAE. Suttles said he is excited about the Company’s recently formed partnerships in the UAE as well as future international opportunities.